How long has it been since your last dental checkup? Neglecting routine dental care and oral hygiene can contribute to a variety of conditions, yet many people ignore their dental health until something goes wrong. 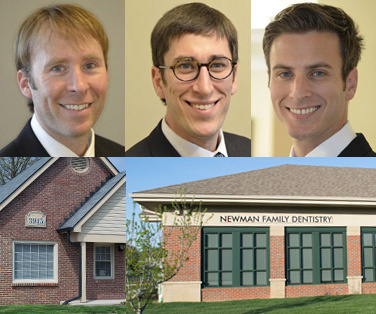 At Newman Family Dentistry, we strive to educate and inform our patients about the importance of regular dental checkups, and provide comprehensive general dentistry to patients from Indianapolis, Carmel, Zionsville, Brownsburg, Avon, Speedway, and many other surrounding areas. Routine dental checkups and other preventive dental care. I Haven't Seen a Dentist in Years. Is a General Dentist the Right Choice? It's easy to let your bi-annual dental checkups slide when you have a mouthful of healthy teeth, but what starts as skipping an appointment here or there can lead to years without a dental checkup. When this happens, you may start noticing problems, like gum and tooth sensitivity – or even tooth loss! Our general dentists, Dr. Don, Dr. Marc and Dr. Mikel can perform most necessary procedures. If you require more advanced services, we may can refer you to a specialist – but here at Newman Family Dentistry, we're able to provide most dental services at our two convenient locations. If you haven's seen the dentist in a while, come back today and we'll help you get your oral health back where it needs to be. What Can I Expect from a General Dentistry Appointment? If you are having your first visit at our practice, we will most likely start with a complete set of x-rays to be able to see all of your teeth and determine if there are any hidden issues. Some patients need only a routine cleaning, while others might require a more advanced process to remove years of built up plaque above and below the gum line. Our dentists will also perform a thorough exam, and if your teeth and gums are healthy, information and instruction will be provided to help you maintain healthy teeth. If you have signs of tooth decay or gum disease, we will discuss a treatment plan with you. It's OK if you feel anxious about visiting the dentist. We understand that it takes a great deal of trust to allow us to examine your mouth, and we believe in building strong personal relationships with each of our patients to ease your fears. Our entire team will always work with you to reduce your anxiety and prevent you from feeling pain or discomfort when in the chair! Ready to get your smile in shape? Call our Carmel or Indianapolis general dentistry office locations, and make an appointment today. We'll welcome you like one of the family, and give you the same great care and consideration we'd deliver to one of our own!